Scores of Muslims gathered outside Al-Aqsa mosque as Israel said men under the age of 50 would be banned from the major mosque for the day in anticipation of more mass protests. Tensions have been high at the compound for two weeks, often erupting into clashes, since two Israeli police officers were killed there, prompting Israel to install metal detectors at the entrance to the site and a subsequent Muslim boycott. 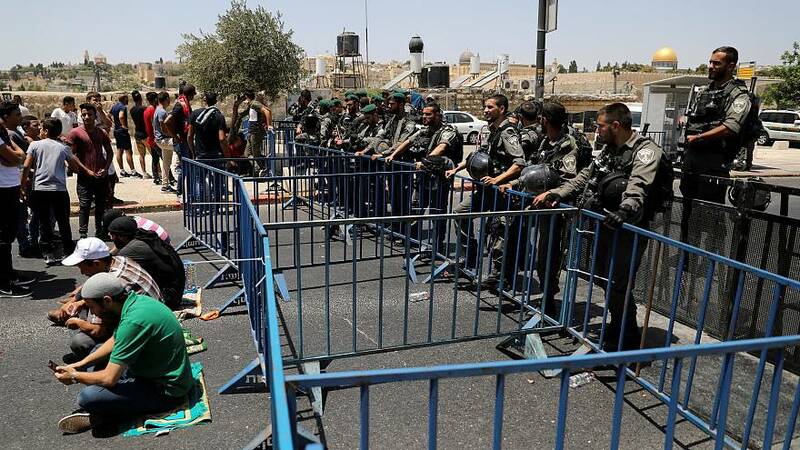 Under immense diplomatic pressure Israel removed the metal detectors, a move welcomed by the Arab world, but violence quickly returned when thousands of Muslim worshippers surged into the mosque, leading to scuffles with police in which dozens were hurt.